Are you looking for some easy Halloween Crafts for kids? With a little less than two weeks to go I’ve rounded up 12 easy Halloween crafts to make with your toddlers or preschoolers. These ideas will keep you crafting up to the spookiest day of the year! I have to be honest, I am not a big fan of skeletons but this one is super cute and really easy to make. 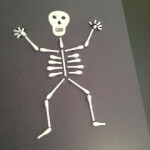 Plus, you can also use this as a fun way to teach them about the bones in the body. I always love fingerprint crafts for kids to make because they have so much fun getting their hands messy! 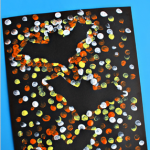 Try this awesome bat silhouette art project, it is easy and toddlers/preschoolers can do it (the painting part). It’s a fun and creative Halloween craft to make! 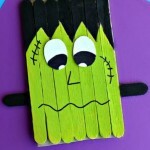 This popsicle stick Frankenstein craft is pretty easy to make and the kids can make him look anyway they want him to! It’s a great Halloween art project that is cheap to make. I think it would also be cute to attach a string on the top so he can hang up on the wall or fridge. 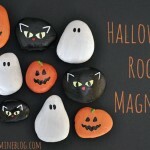 These Halloween rock magnets are sure to be a crowd favourite and for an extra twist use glow in the dark paint and stick them outside. How cute are those black cats! 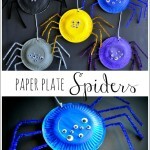 Paper Plate Spiders are so simple to make, your kids will LOVE them and they make spooktacular decorations!! Sure, some monsters are scary, but these guys are fun and friendly, and super-goofy! I just love all the googlie eyes! Even though kids will think they are scary, we all know that they are secretly super cute 😉 This candy corn monster is RAWRtastic! Now here’s a spooky little craft that you can really sink your teeth into. 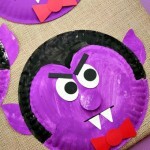 These little Paper Plate Dracula’s were so fun to make. Plus I have a thing for Sesame Street and he kind of reminds me of the Count Von Count. 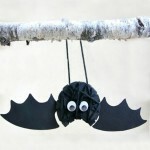 Now if we have Dracula then we need some of these adorable little yarn wrapped bats! 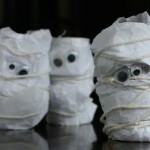 These toilet roll mummies might just be the cutest one yet! And they were so easy to make! A little tissue paper, a little toilet roll tube, and lots of winding and wrapping around and around! 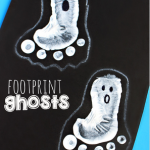 Make these adorable footprint ghosts with your kiddos this Halloween! 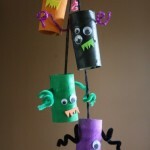 You can even cut them out and make some awesome garland for a Halloween party decoration. Kids get a kick out of them when they’re finished! Who said witches are scary? 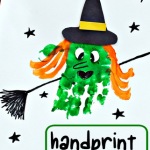 For a fun craft, try using your kiddo’s hand to make a handprint witch art project! This turned out adorable and can be customized anyway you want! What’s your favourite Halloween Craft for kids? 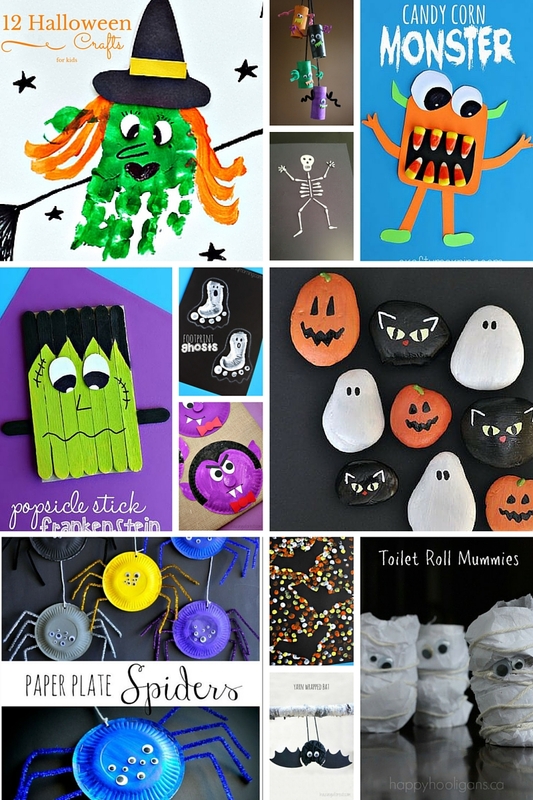 Check out our All things halloween board on Pinterest for more Halloween Crafts for kids. Love these. Such great ideas for toddlers. I’m going to try the witch hand. Cute Halloween crafts. I think Halloween has some of the cutest crafts and desserts. Totally copying them for my Halloween Party! Thank you sooo much for sharing it! 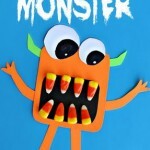 What a great roundup of Halloween crafts! Perfect for Halloween parties with kids this year. I especially love the toilet paper mummies. These are just darling. I can’t get over the bat, SO cute! I was in the store today looking at candy corn trying to see what I could do with it for a Halloween craft. So glad I found your blog post with just the right crafts! Such a fantastic roundup! I love those little ghost feet. Adorable! I love the candy corn teeth and the Popsicle Stick Frankenstein would be a huge hit with my three-year-old. He loves Frankenstein! I haven’t seen most of these before- so cool! I love the candy corn monster and spider plates! These are such adorable ideas! My littlest loves to craft and we’ve been making quite a few fun things but I see tons of inspiration on this list! And the best part is there is plenty of time to get crafty before Halloween! My kids would really like to make some toilet paper mummies. The paper plate Dracula is a fun idea too. Such cute ideas! I want to make that Popsicle stick Frankenstein with my kids!